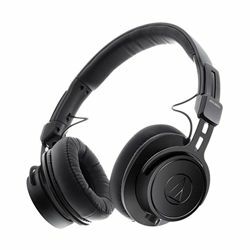 Designed for studio, broadcast and mobile applications, the ATH-M60x on-ear professional monitor headphones utilize the same proprietary 45 mm large-aperture drivers found in the legendary ATH-M50x headphones, delivering exceptional clarity throughout an extended frequency range with accurate bass response. The low-profile, closed-back, on-ear design provides excellent sound isolation and a great fit, which is enhanced by the exceptional comfort and durability of memory foam earpads and headband. The headphones come with three interchangeable cables (1.2 m - 3.0 m coiled, 3.0 m straight, and 1.2 m straight – each with a 3.5 mm (1/8") mini-plug), a 6.3 mm (1/4") screw-on adapter, and a protective carrying pouch.